VietNamNet Bridge – Ngoc Linh ginseng (Panax vietnamensis), a kind of precious herb, is in the danger of getting depleted. 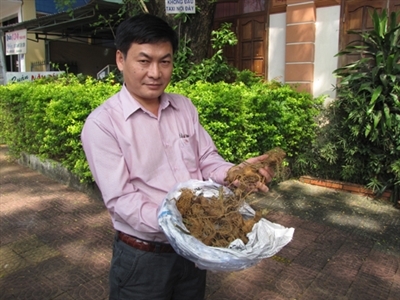 Scientists say it is very difficult to find real purebred Ngoc Linh ginseng nowadays. Counterfeit Ngoc Linh ginseng have been sold in the open air in the central province of Kon Tum at sky high prices of between several millions dong and tens of millions of dong per kilo of fresh bulbs. The products include the ones brought from the north which are introduced as Ngoc Linh ginseng. However, scientists believe these are false ginseng, not Ngoc Linh ginseng. They also warned that false ginseng seeds have also been brought from the north to be grown in the locality. If the false ginseng is grown in a large scale, Vietnam would not have purebred Ngoc Linh ginseng any more. Who controls Ngoc Linh ginseng genetic resource? Natural Ngoc Linh ginseng grows at the altitude of 1,200 meters and higher, under the canopies of the old forests. To date, Ngoc Linh has been found only in two provinces of Kon Tum and Quang Nam. It is a herbaceous perennial plant, 40 cm to 1 meter high. At first glance, it looks like Korean ginseng, but scientists can easily tell the difference between Ngoc Linh and false ginseng thanks to the notches on the roots. Ngoc Linh belongs to Panax family; therefore, it looks like other Panax family members. This has prompted people to bring false ginseng products and variants from the north to Kon Tum to sell as Ngoc Linh ginseng. There are many institutions and individuals growing Ngoc Linh ginseng in Kon Tum, while others are seeking the provincial authorities’ permission to develop Ngoc Linh ginseng farms. Scientists have warned that once false ginseng enters the Ngoc Linh’s territory and mixes with Ngoc Linh, this would generate a new variety in five or 10 more years. The new variety may infringe in the new land and push purebred Ngoc Linh into exhaustion. Vietnamese scientists and investors have decided that they need to take actions to help maintain the precious and valuable ginseng variety through the plans on Ngoc Linh commercial development. The Ministry of Science and Technology is running a project to cultivate and develop the national Ngoc Linh ginseng brand, under which it would develop 1,000 hectares of Ngoc Linh by 2023. The project would be capitalized at VND567 billion. However, the problem is that no state management agency or research institute has come forward and taken the responsibility for controlling the purebred Ngoc Linh ginseng variety. A Ngoc Linh ginseng grower in Kon Tum province said it is very difficult to tell the difference between Ngoc Linh and false ginseng, which is also a Panax family member. A source said that some 9 kilos of false ginseng seeds was brought to Kon Tum in 2013, which then was carried to a company which would grow them in the locality. Unlike Ngoc Linh, false ginseng can grow at the altitude of less than 1,200 meters. Growers can harvest false ginseng after 2-3 years of cultivation. Meanwhile, it will take people at least 10 years to grow Ngoc Linh.